Extracção de matérias primas, fabrico, transporte, utilização e destino final dos produtos Inputs de matérias primas & outputs de resíduos Gestão Ambiental : Gestão das actividades de uma organização que têm, ou podem potencialmente ter, impacte no ambiente Business activities have environmental impacts through the extraction of raw materials, manufacturing of products, transportation, product use & disposal or provision of services. The environment plays a dual role in that it is the source of raw material inputs for products and services while at the same time it is the final resting place for our waste outputs. Environmental Management can be described as managing those activities of an organisation that have or can potentially have an impact on the environment such that the resulting impact on the environment is reduced. 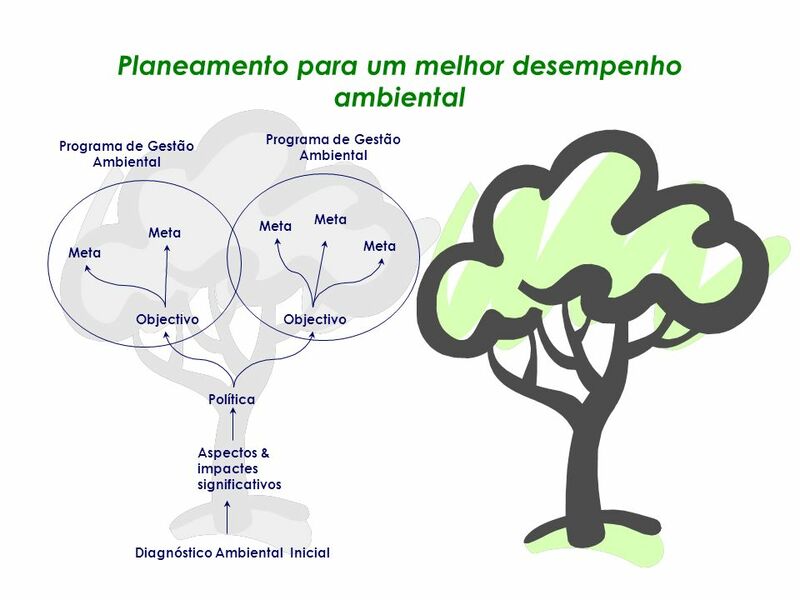 Componentes interrelacionadas: Política Ambiental Planeamento Implementação & Operação Verificação & Acção Correctiva Revisão pela Gestão Gerir as actividades que podem ter impacte no ambiente. At its most basic level an EMS can be viewed as a number of interconnected parts that work together to manage those activities of a firm that have or can potentially have an impact on the environment. The interconnected parts that form the EMS as defined by ISO are: Environmental Policy Planning Implementation & Operation Checking & Corrective Action Management Review Environmental management systems can be formal and standardised, such as ISO and EMAS, or they can be informal such as an internal waste minimisation programme or the unwritten means and methods by which an organisation manages its interaction with the environment. 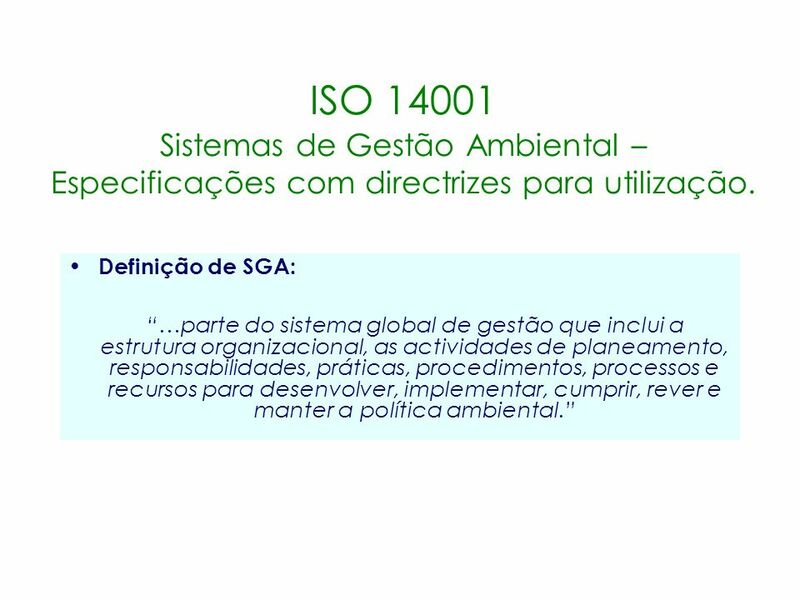 6 ISO 14001 Sistemas de Gestão Ambiental – Especificações com directrizes para utilização. 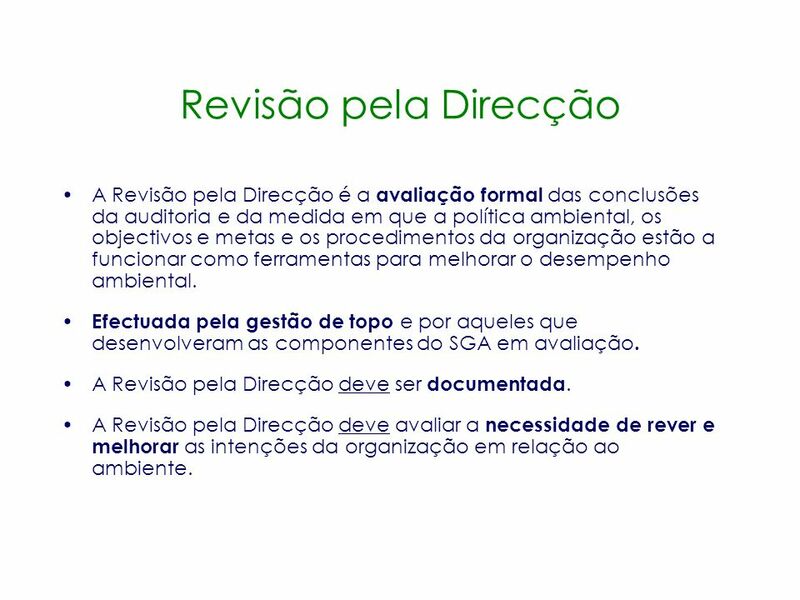 Definição de SGA: “…parte do sistema global de gestão que inclui a estrutura organizacional, as actividades de planeamento, responsabilidades, práticas, procedimentos, processos e recursos para desenvolver, implementar, cumprir, rever e manter a política ambiental.” The standard aims to: Support proactive environmental work. Provide tools for implementing an EMS Support organisations attempting to reach environmental and financial goals Encourage implementation of Best Available Technology (BAT). The standard focuses on the external environment and does not cover Worker Health & Safety issues. The standard provides: A model for environmental management systems. A specification of elements that can be objectively evaluated and audited. Guidance for use of the specifications. A systematic, verifiable and traceable working methodology. 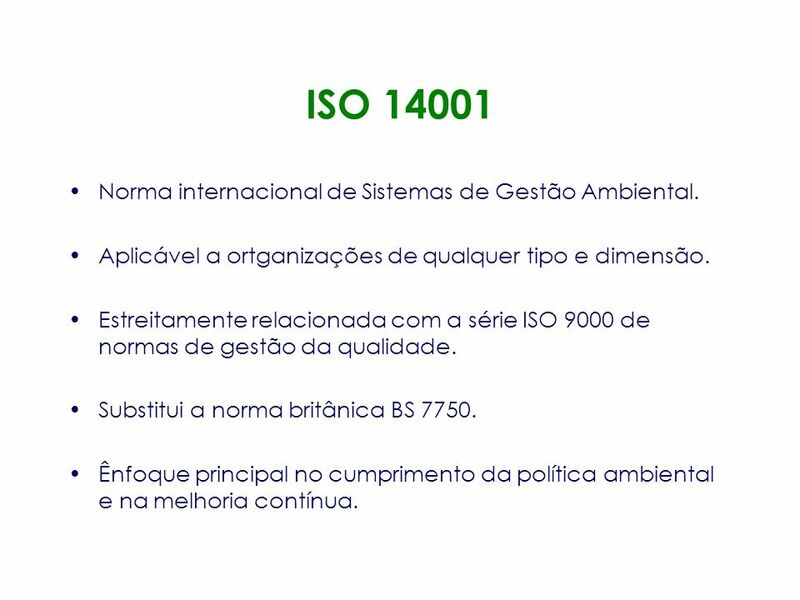 7 ISO 14001 Norma internacional de Sistemas de Gestão Ambiental. Aplicável a ortganizações de qualquer tipo e dimensão. Estreitamente relacionada com a série ISO 9000 de normas de gestão da qualidade. Substitui a norma britânica BS 7750. Ênfoque principal no cumprimento da política ambiental e na melhoria contínua. ISO is an international standard that specifies the requirements of an environmental management system. It comes under the umbrella of the international trade rules of the new World Trade Organisation (WTO) It has been written to be applicable to organisations of different types and sizes under different geographical, cultural and social conditions. A key focus of the standard is its commitment to continual improvement from all levels and functions of the organisation. The standard aims to support environmental protection and prevention of pollution in balance with socio-economic needs. 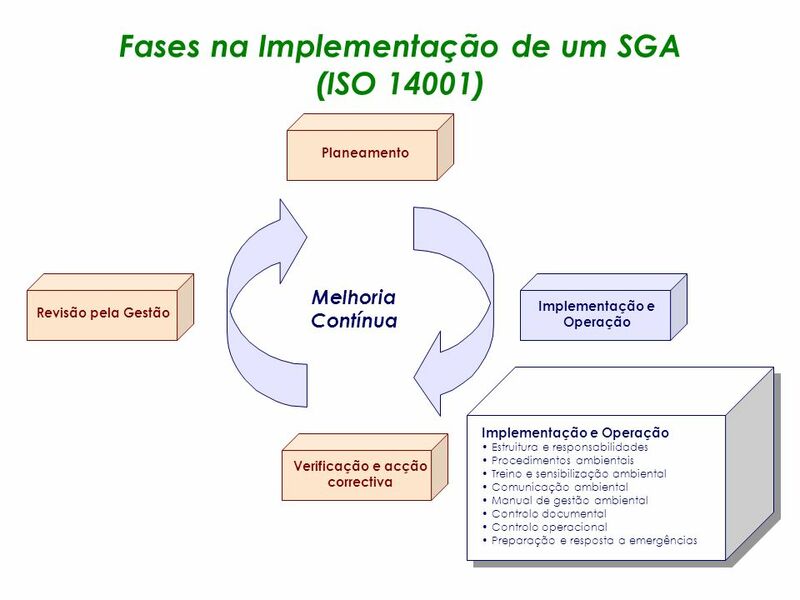 ISO describes requirements for certification of an organisation’s EMS and enables an organisation to establish, and assess the effectiveness of the system and demonstrate conformance to others. Análise compreensiva dos aspectos, impactes, desempenho e actividades controláveis da organização. 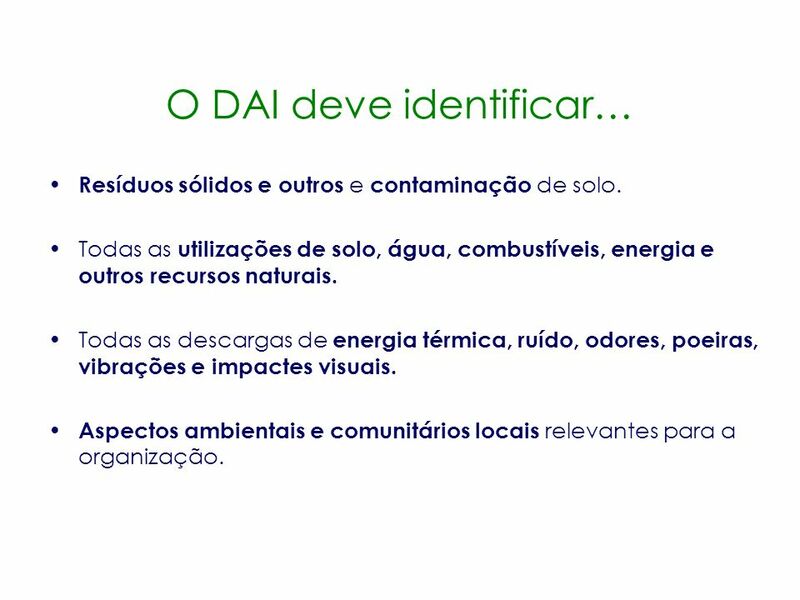 A realização do DAI estabelece a posição actual da organização em relação ao desempenho ambiental. What is the Initial Environmental Review? Accepting that all organisations have an impact on the environment and that improved environmental performance is a direct result of controlling and minimising those impacts, a first step towards improving performance would be to assess what impacts need to be controlled or minimized. This is the purpose of the initial environmental review (IER). 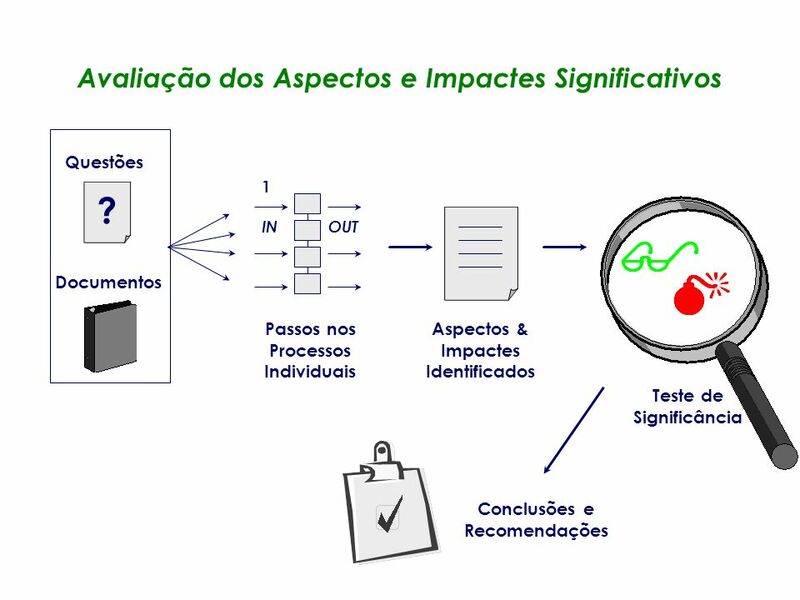 It is a systematic identification and documentation of the significant environmental impacts (or potential for impacts) associated directly or indirectly with your organisation's activities, products and processes. 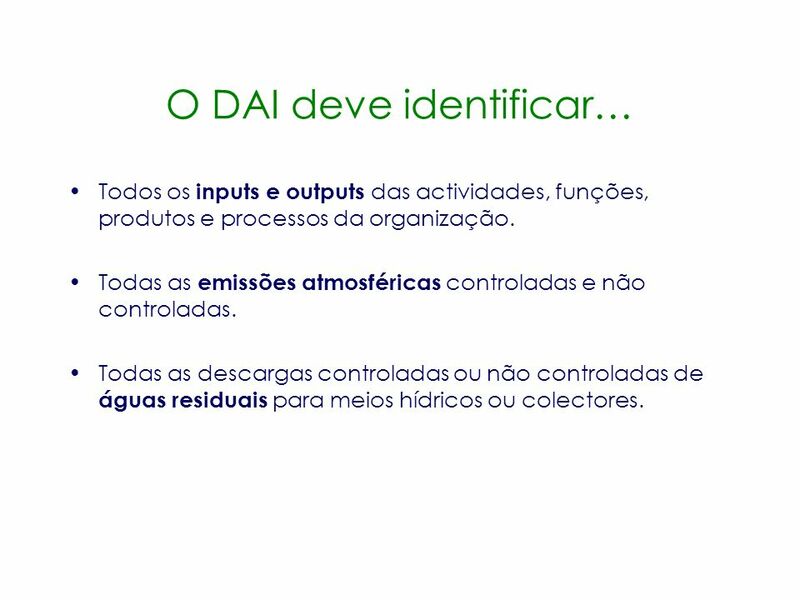 By completing this process of identification, you are able to improve your environmental performance by controlling the operations (activities, products and processes) that cause the significant environmental impacts identified. In short, controlling aspects reduces or minimises impacts. 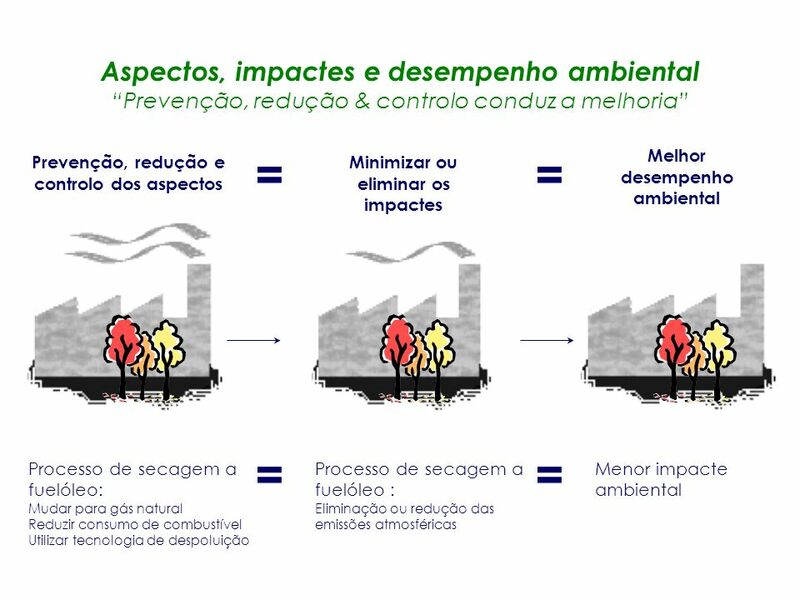 O Diagnóstico Ambiental Inicial deve incluir: Revisão das práticas de gestão ambiental da organização. 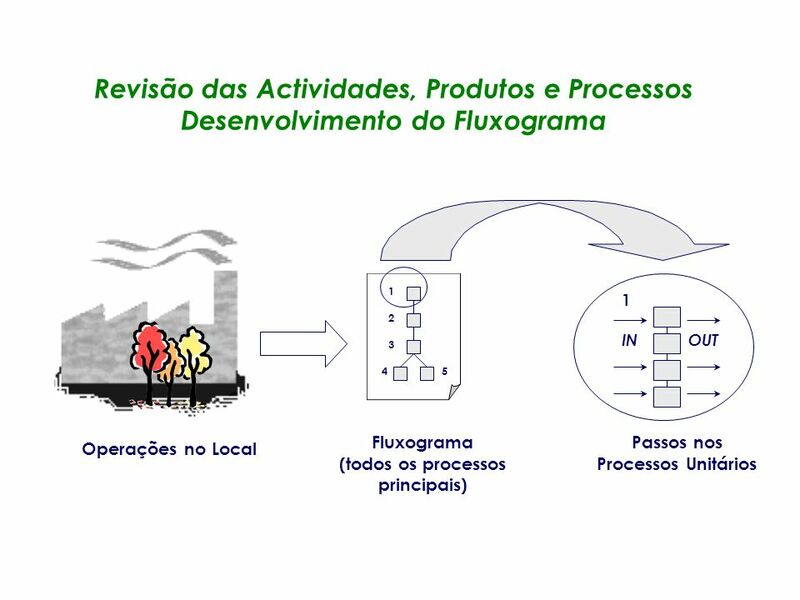 Revisão das actividades, produtos e processos da organização. Revisão de acidentes e incidentes ambientais ocorridos no passado. Revisão da legislação relevante. A review of environmental management practices of the organisation As a first step, it is crucial to establish what environmental management structure, if any, already exists and to determine what management improvements would be required . A review of the activities, products, and processes of the organisation The second key area to be covered in the IER is the identification of environmental aspects of your activities, products and processes (cause) that have a significant environmental impact (effect) on the environment. Review of past environmental accidents and incidents The third key area to be covered in the IER is an identification of past environmental accidents and incidents that may have occurred on the site and that could lead to present or future environmental impacts. Review of relevant legislation The fourth key area to be covered in the IER is the identification of all legislation, regulations, authorisations, and industry codes of conduct that are associated with your actual or potential environmental impacts. 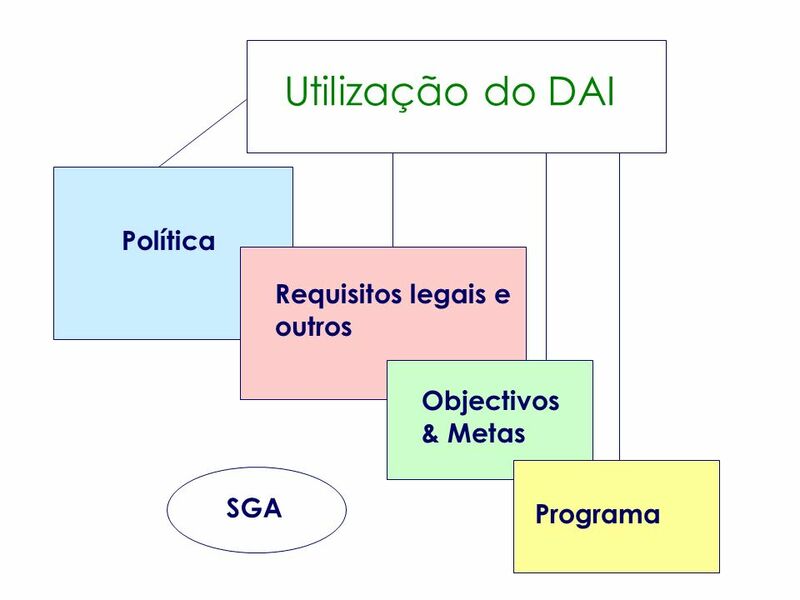 Todos os inputs e outputs das actividades, funções, produtos e processos da organização. Todas as emissões atmosféricas controladas e não controladas. Todas as descargas controladas ou não controladas de águas residuais para meios hídricos ou colectores. Your initial environmental review should be a comprehensive analysis of environmental issues, aspects, impacts, performance and controllable activities of your organisation. Performing an initial environmental review should establish your current position in relation to environmental performance. Your initial environmental review should form the basis for developing your organisation’s environmental policy, objectives and targets, environmental management programmes, and the other components of the entire EMS. More specifically, your initial environmental review should identify: all inputs to your activities, products or processes, all outputs from your activities, products or processes, all air emissions (controlled and uncontrolled) from your activities, products or processes, all effluents (controlled and uncontrolled) from your activities, products or processes…..
22 Aspectos e Impactes A empresa deve ser capaz de indentificar e prioritizar continuamente os impactes ambientais, de modo a possibilitar o estabelecimento de objectivos e metas relevantes. Before an organisation can ‘manage’ (and subsequently control and minimise) its environmental aspects and impacts it must first identify and document what those aspects and impacts are and record the findings of such a process. In short, the register of environmental aspects and impacts is the documented record of significant environmental aspects and correlating impacts that the organisation must control and minimise to improve its overall corporate environmental performance. 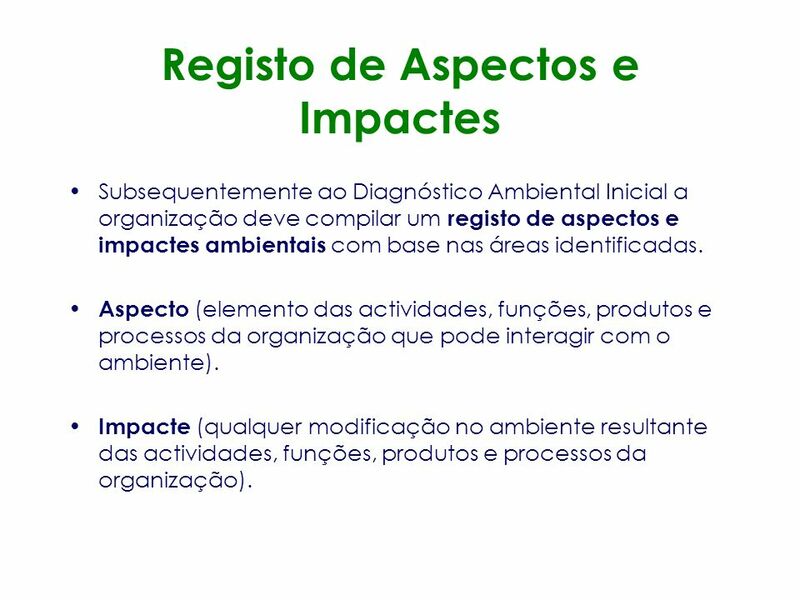 Subsequentemente ao Diagnóstico Ambiental Inicial a organização deve compilar um registo de aspectos e impactes ambientais com base nas áreas identificadas. 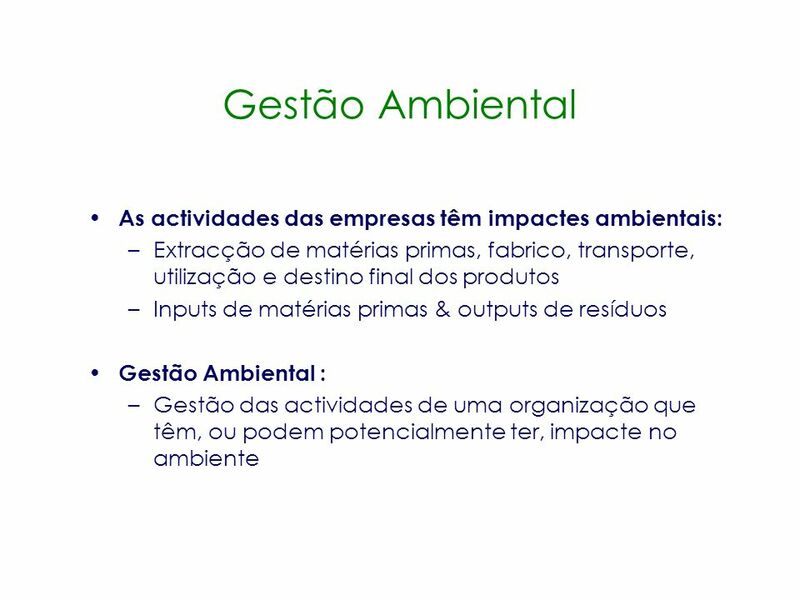 Aspecto (elemento das actividades, funções, produtos e processos da organização que pode interagir com o ambiente). 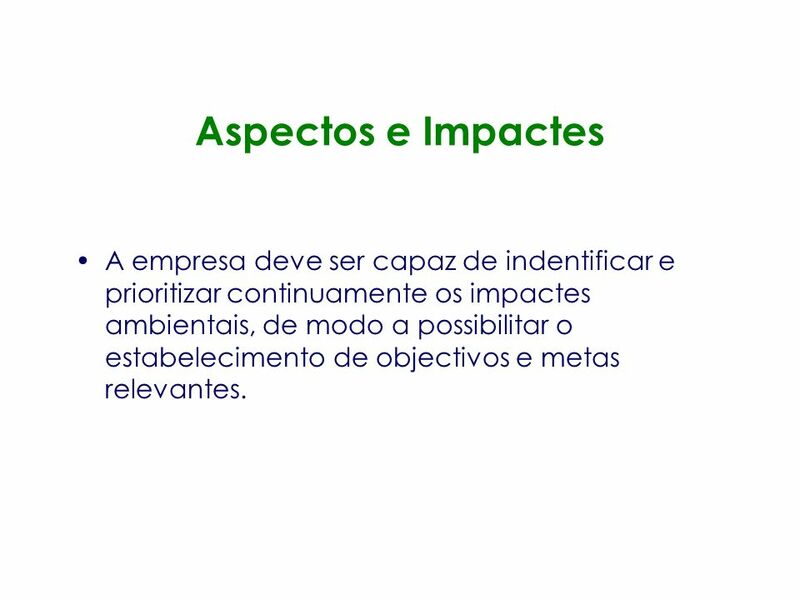 Impacte (qualquer modificação no ambiente resultante das actividades, funções, produtos e processos da organização). Subsequent to the completion of your initial environmental review, you must compile a register that includes all aspects and impacts identified as being significant. This register will likely resemble parts of the executive summary of your initial environmental review. The register of environmental aspects and impacts should list all significant environmental aspects and impacts and indicate where they occur in the overall process. 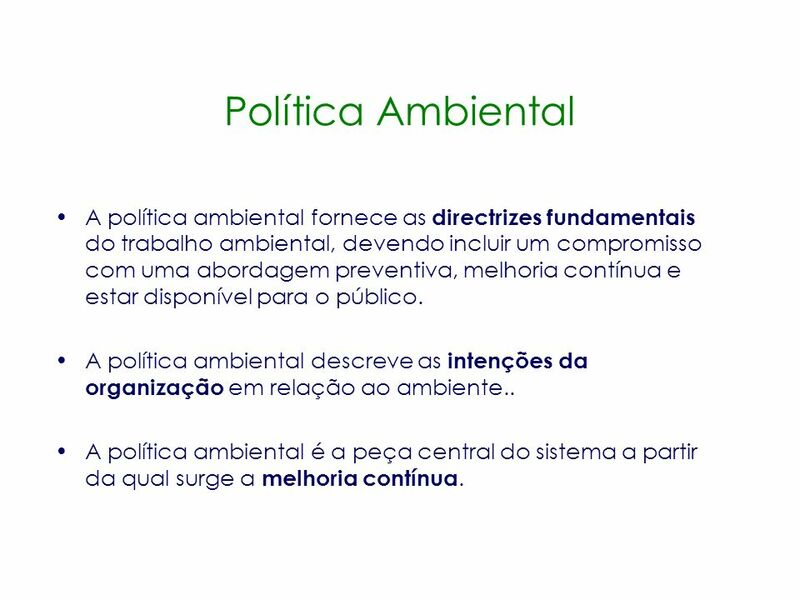 25 Política Ambiental A política ambiental fornece as directrizes fundamentais do trabalho ambiental, devendo incluir um compromisso com uma abordagem preventiva, melhoria contínua e estar disponível para o público. A política ambiental descreve as intenções da organização em relação ao ambiente.. A política ambiental é a peça central do sistema a partir da qual surge a melhoria contínua. The environmental policy provides the basic guideline for the environmental work and shall include: a commitment to a preventive approach, continuous improvement and be publicly available. The objective of this step is to explain what the environmental policy is. This step will provide you with the skills necessary to develop an environmental policy as the starting point for a functional EMS. 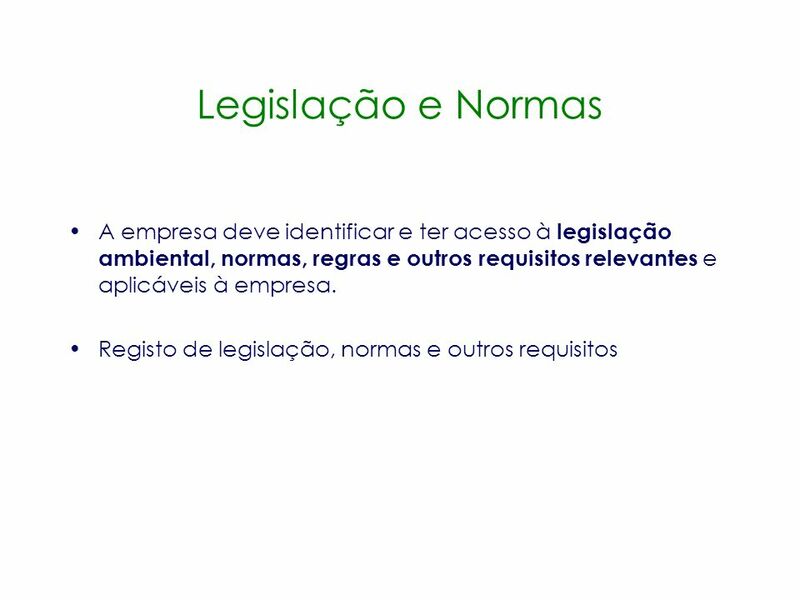 26 Legislação e Normas A empresa deve identificar e ter acesso à legislação ambiental, normas, regras e outros requisitos relevantes e aplicáveis à empresa. 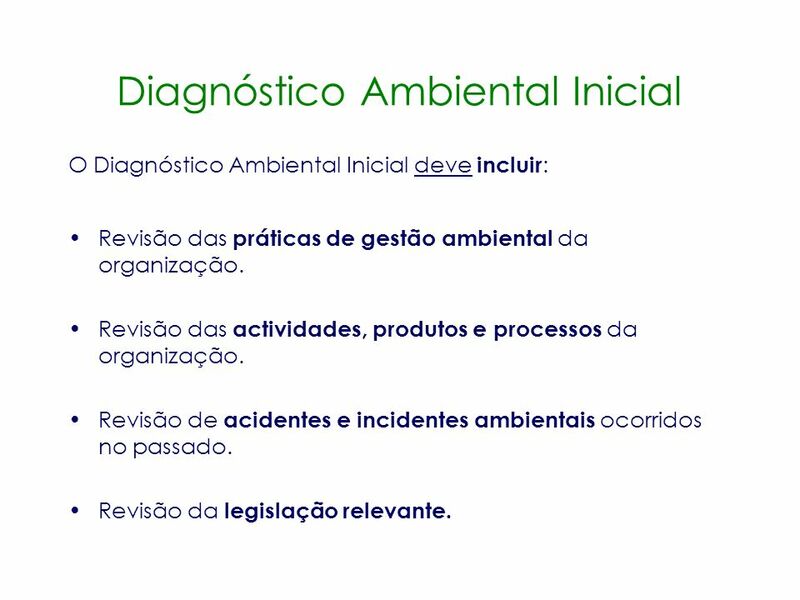 Registo de legislação, normas e outros requisitos One of the fundamental requirements of the environmental policy is that it contains a stated commitment to comply with all relevant environmental legislation and regulations by which the organisation may be bound. Consequently, for an EMS to be truly effective (and certifiable) it must ensure that all its activities, products and processes are themselves compliant with relevant environmental legislation and regulations. The objective of this step is to explain what the register of environmental legislation and regulations is. This step will provide you with the skills necessary to develop your own register of environmental legislation and regulations sufficient to maintain a functional EMS. Objectivos gerais de desempenho que são reflectidos nas declarações contidas na Política Ambiental. Estabelecidos pela organização. Metas Ambientais As metas são requisitos de desempenho detalhados e quantificados, incluindo calendarização, desenvolvidos para cumprir os objectivos estabelecidos. Environmental objectives are the broad goals that your organisation sets in order to improve environmental performance. Environmental objectives are goals such as ‘reduce water use’ or ‘improve energy efficiency’. Objectives are overall performance goals that must be reflected in the environmental policy. 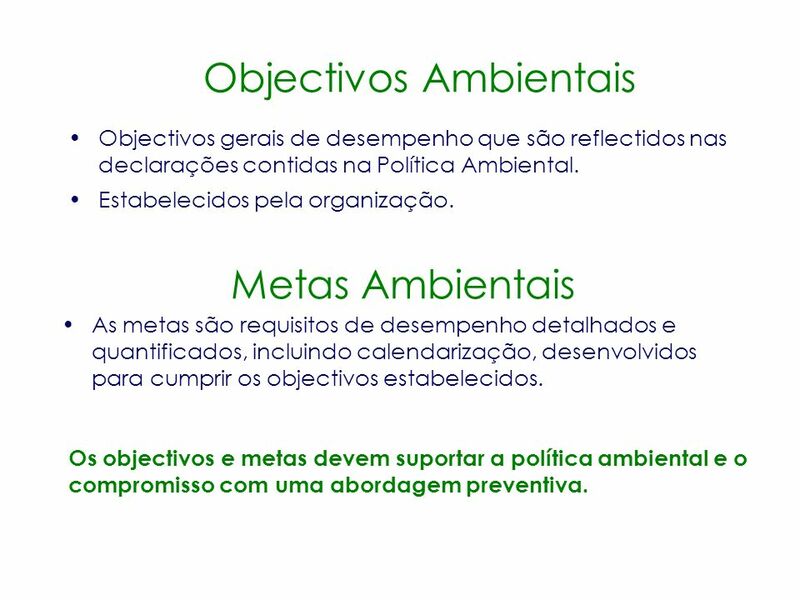 Os objectivos e metas devem suportar a política ambiental e o compromisso com uma abordagem preventiva. 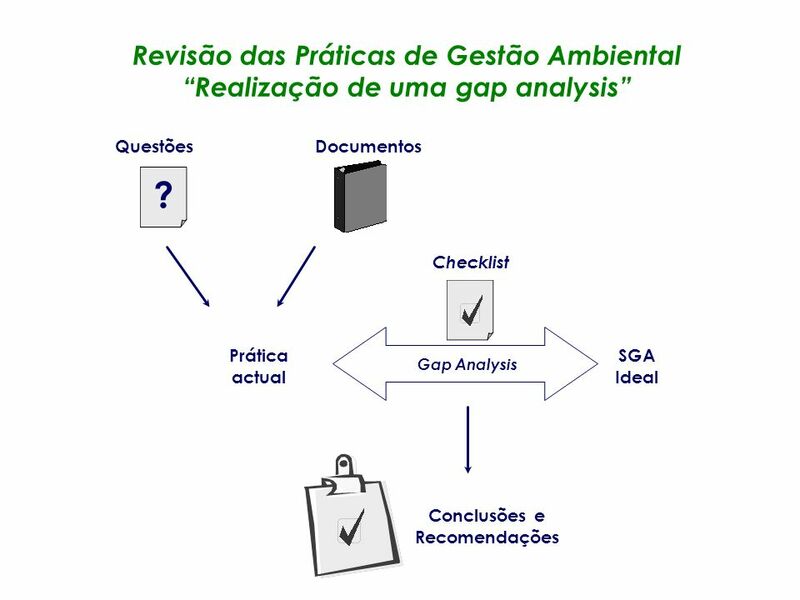 Contém as directrizes para alcançar os objectivos e metas for achieving the objectives and targets que foram estabelecidos para cumprir a Política Ambiental. 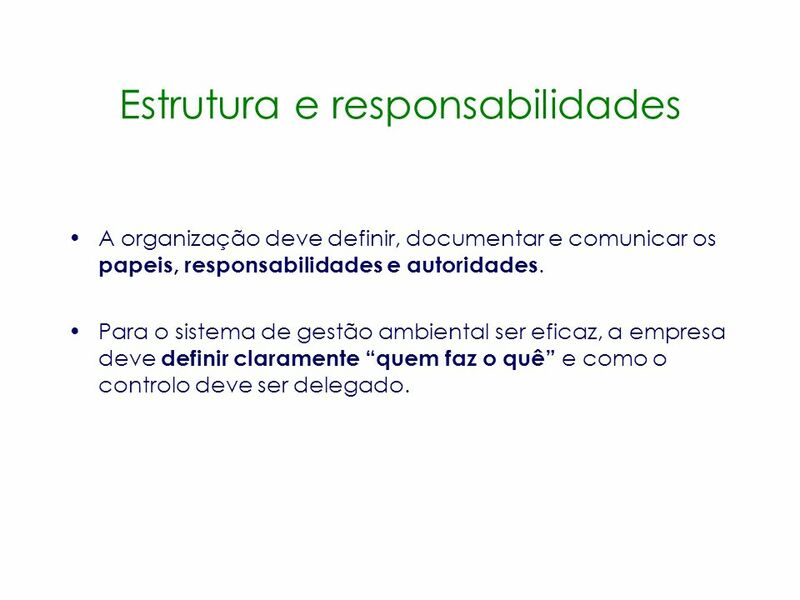 A organização deve afectar responsabilidades para alcançar objectivos e metas. Os recursos disponíveis e calendários para os alcançar devem também ser estabelecidos. 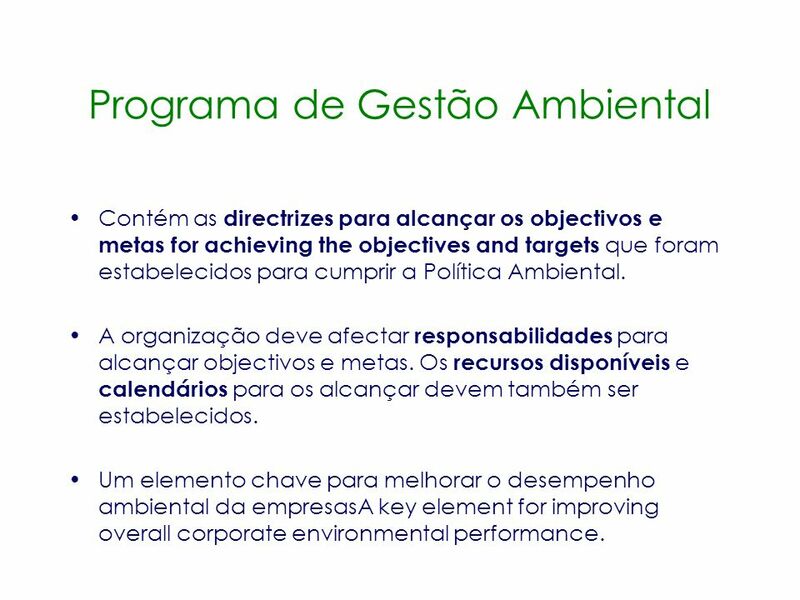 Um elemento chave para melhorar o desempenho ambiental da empresasA key element for improving overall corporate environmental performance. An environmental management programme is essentially a detailed recipe for meeting the objectives and targets set. Thus, for a given objective the environmental management programme identifies how targets will be met, who is responsible for each of the activities required to meet that target and when those activities will be completed. The objective of this step is to explain what environmental management programmes are. This step will provide you with the skills necessary to develop your own environmental management programmes sufficient to maintain a functional EMS. Your environmental management programmes are the vehicles by which your objectives and targets are realised. Successful implementation, control and revision of your programmes will fuel the engine of improved environmental performance! A organização deve definir, documentar e comunicar os papeis, responsabilidades e autoridades. Para o sistema de gestão ambiental ser eficaz, a empresa deve definir claramente “quem faz o quê” e como o controlo deve ser delegado. With the building blocks of your management system ready for assembly, to develop a functional EMS you now need to establish what form or 'structure' your system will have. Just as other management systems come in a variety of structures, the structure your EMS takes on will be unique to your company and reflect the organisational management that already exists. The objective of this step is to explain what structure and responsibilities are. This step will provide you with the skills necessary to identify what structure and responsibility is required to maintain a functional EMS. 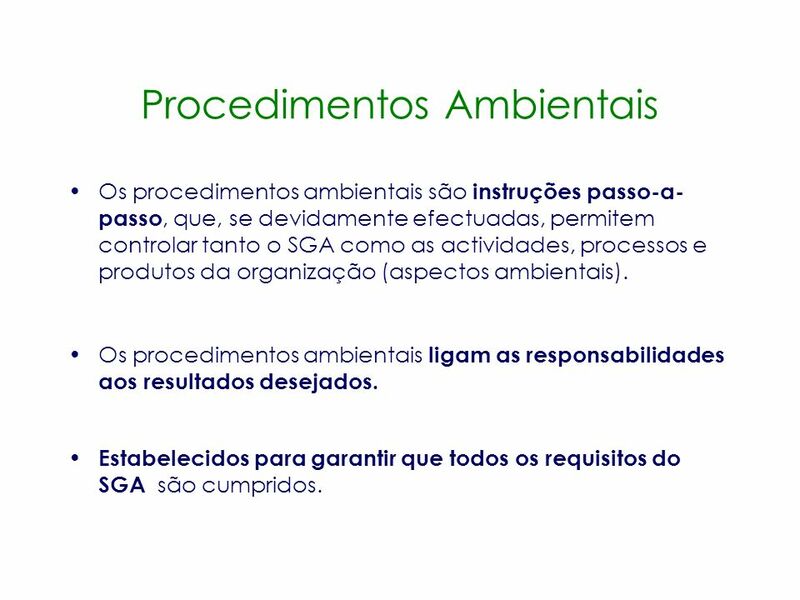 Os procedimentos ambientais são instruções passo-a-passo, que, se devidamente efectuadas, permitem controlar tanto o SGA como as actividades, processos e produtos da organização (aspectos ambientais). Os procedimentos ambientais ligam as responsabilidades aos resultados desejados. Estabelecidos para garantir que todos os requisitos do SGA são cumpridos. In short, procedures should be prepared for: all actions - activities, products and processes (aspects) that have, or could have if uncontrolled, a significant direct or indirect effect (impact) on the environment, all actions that effect, or could affect, the success of a stated objective and thus the environmental policy. 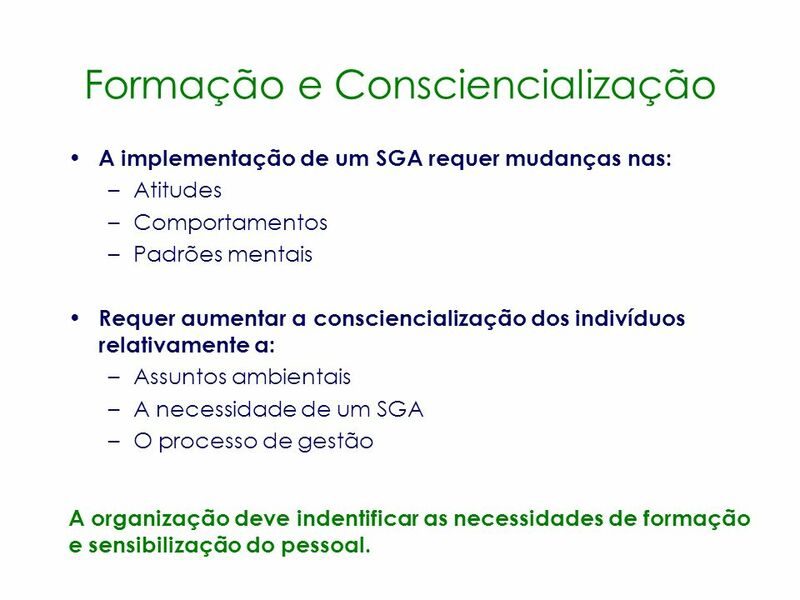 A implementação de um SGA requer mudanças nas: Atitudes Comportamentos Padrões mentais Requer aumentar a consciencialização dos indivíduos relativamente a: Assuntos ambientais A necessidade de um SGA O processo de gestão For an EMS to be successful at meeting the policies and objectives set, the various people within that system need to be aware of those policies and objectives and understand how their actions effect the overall environmental performance of the site. The objective of this step is to explain what environmental training and awareness is. This step will provide you with the skills necessary to identify what environmental training and awareness is required to maintain a functional EMS. In developing, implementing and maintaining an EMS, many companies provide three levels of training which reflect the overall environmental training needed to develop, implement and maintain a functional EMSs. The first level of training is typically general environmental awareness training and an introduction to environmental management. Level 1 training is often referred to as Environmental Awareness Training, should be provided to all personnel. Level 2 training is often referred to as Aspects and Impacts Training and is usually more specific to the aspects and impacts identified. This training should be provided to all personnel whose work activities are associated with or could create a significant environmental impact. Level 3 training is often referred to as EMS Training or EMS Auditing and is usually more detailed training on the EMS being developed and would be provided to all personnel who have identified roles and responsibilities in developing, implementing, auditing and maintaining the EMS. A organização deve indentificar as necessidades de formação e sensibilização do pessoal. 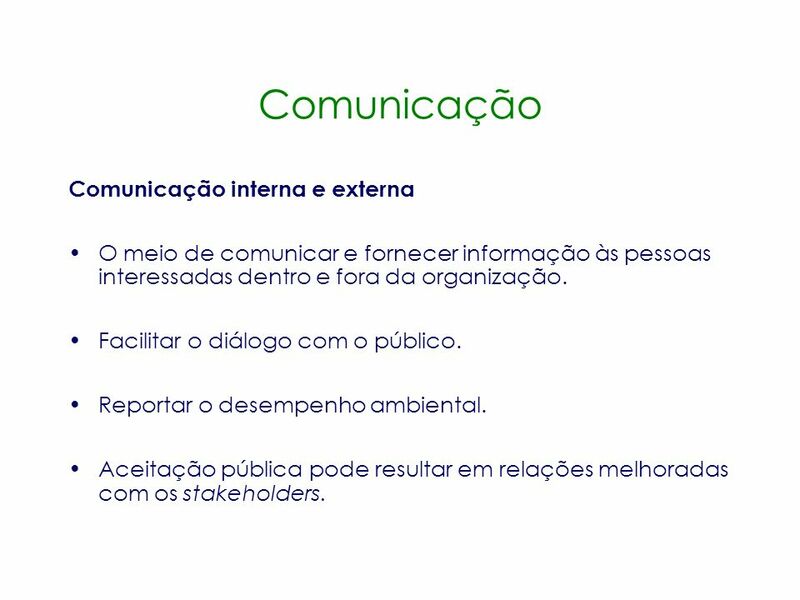 O meio de comunicar e fornecer informação às pessoas interessadas dentro e fora da organização. Facilitar o diálogo com o público. Reportar o desempenho ambiental. Aceitação pública pode resultar em relações melhoradas com os stakeholders. Environmental communication generally falls into two categories - internal communication and external communication. A functional system relies not only upon trained individuals but also communication between them. Furthermore, a functional EMS is not only dependent upon internal communication within the system but also between the system itself and the numerous external stakeholders it effects. The objective of this step is to explain environmental communication is. This step will provide you with the skills necessary to identify what environmental communication is required to maintain a functional EMS. Internal communication is the communication between the various levels and functions involved in the development, implementation and maintenance of you EMS. Internal environmental communication would include things such as training personnel on the environmental policy, interaction between personnel with identified responsibilities for maintaining the EMS, informing upper management on changes to or results of your EMS. External communication is essentially communication with those who are affected by your environmental aspects and/or your EMS. Your environmental policy is also a form of external communication. 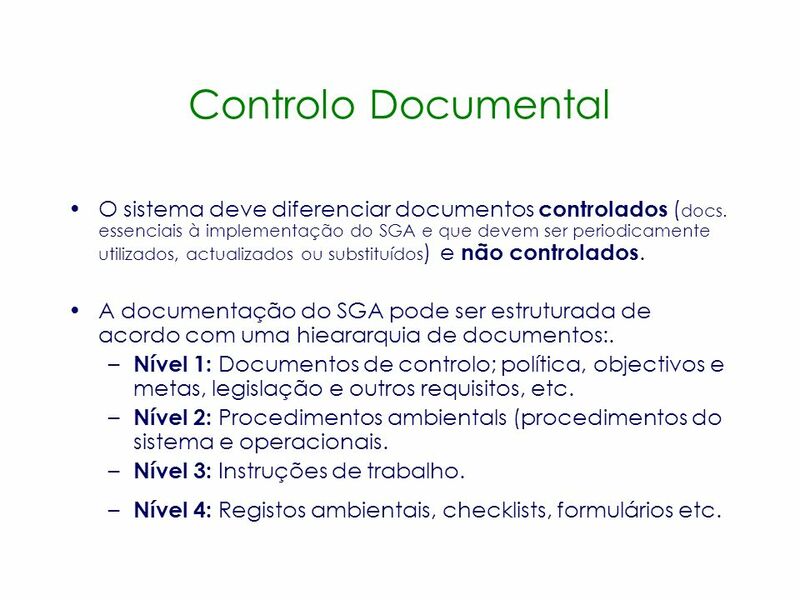 A organização deve documentar e descrever: As componentes fundamentais do SGA O modo como elas interagem Referências a documentação relacionada. The environmental management manual is the central tool or reference for the key documents that are required for maintaining and auditing your EMS over time. 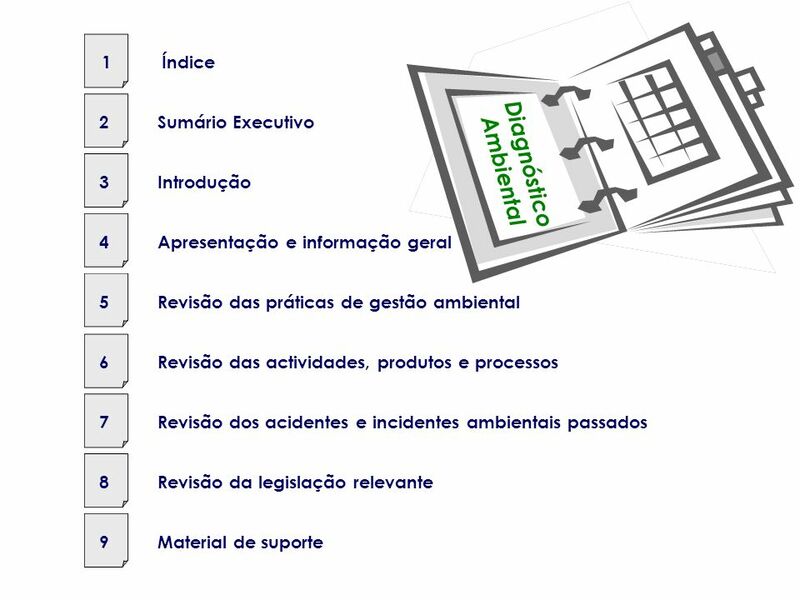 The objective of this step is to explain what the environmental management manual is. This step will provide you with the skills necessary to develop your own environmental management manual. Instrumento chave para controlar o sistema de gestão. Ponto de referência central Central para manter e auditar o SGA. 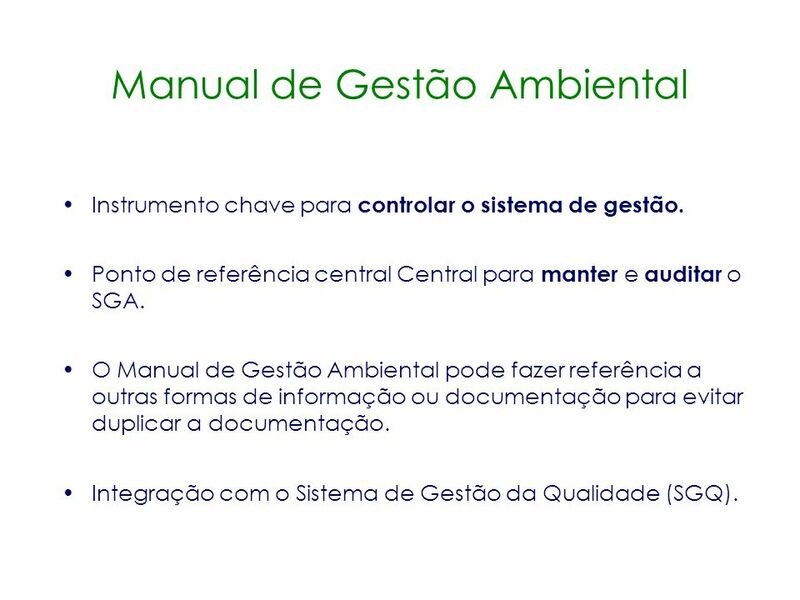 O Manual de Gestão Ambiental pode fazer referência a outras formas de informação ou documentação para evitar duplicar a documentação. 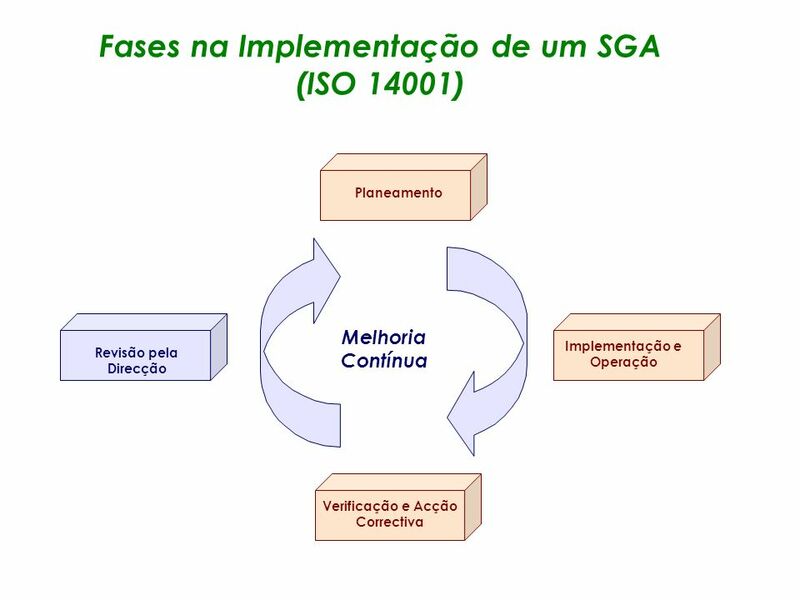 Integração com o Sistema de Gestão da Qualidade (SGQ). The manual can be a single binder containing all your key EMS documents or it can simply be an index referring to the location of those key documents. The choice you make must reflect the needs of your organisation and will be dictated largely by existing documents that you will want to incorporate into your emerging EMS. 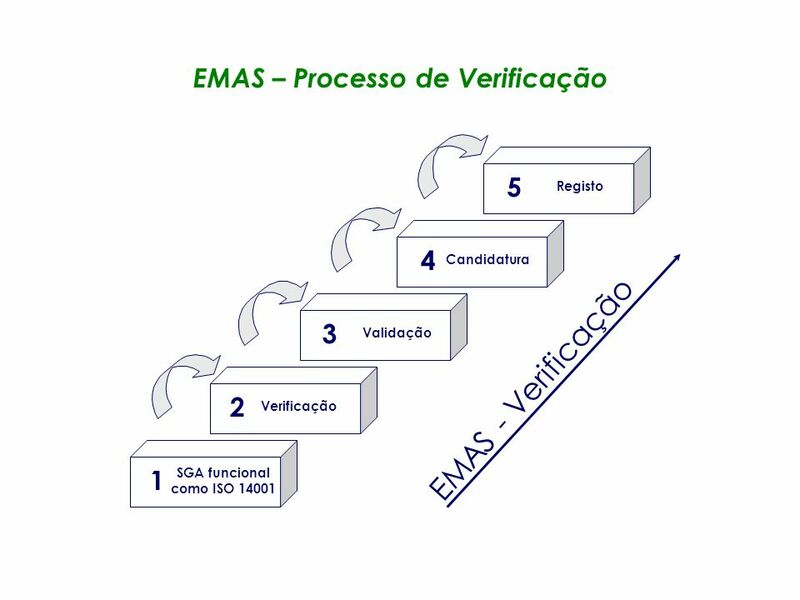 The EMM it is not an explicit requirement of either ISO or EMAS, but for both ISO and EMAS it is required that you maintain information or documentation on the core elements of you EMS. Core elements should be seen as those that are essential to meeting the stated intentions expressed in your environmental policy and would include: the environmental policy, environmental objectives and targets, environmental management programmes, procedures roles and responsibilities within the EMS and the various interactions between the elements of your EMS. Os documentos podem ser prontamente localizáveis. A documentação é actualizada. Versões desactualizadas dos documentos são removidas. Documentos não controlados estão claramente marcados. Garantir que todos os documentos do SGA são legíveis e claramente marcados com a data de preparação, data de revisão, título e versão do documento. You must have a written procedure detailing how you control EMS documents to ensure they can be located and that they are periodically reviewed and revised. This procedure must state how you ensure that current versions of documents are kept and locatable when needed and those obsolete documents are removed or labeled appropriately. The objective of this step is to explain what document control is. This step will provide you with the skills necessary to ensure that your level of document control is sufficient to maintain a functional EMS. The key point of document control is that if you maintain documented information about a system, whether that system is a quality management system, health and safety system or an EMS, the documents you maintain should be ‘controlled’. Essentially, document control is the set of procedures by which you ensure your EMS documents are organised, current, locatable, and ‘controlled’ in a manner that guarantees their efficacy. 38 Controlo Documental O sistema deve diferenciar documentos controlados (docs. 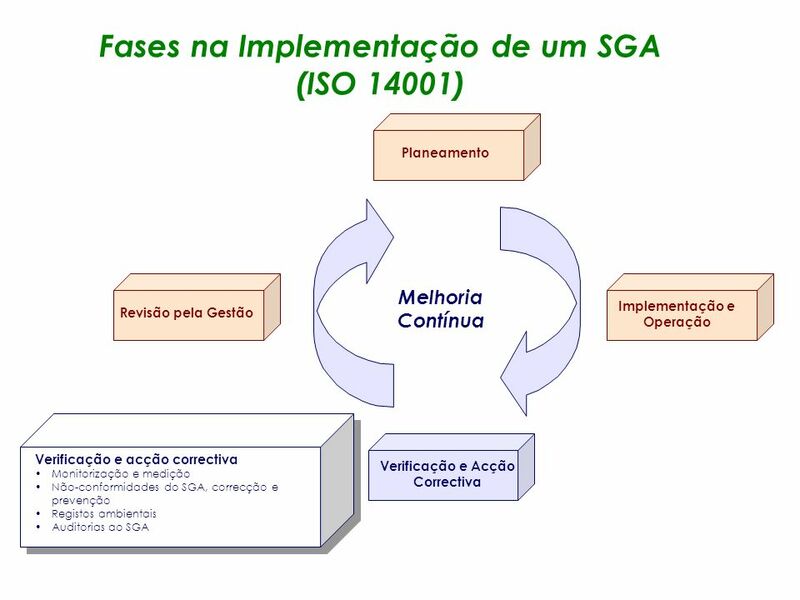 essenciais à implementação do SGA e que devem ser periodicamente utilizados, actualizados ou substituídos) e não controlados. 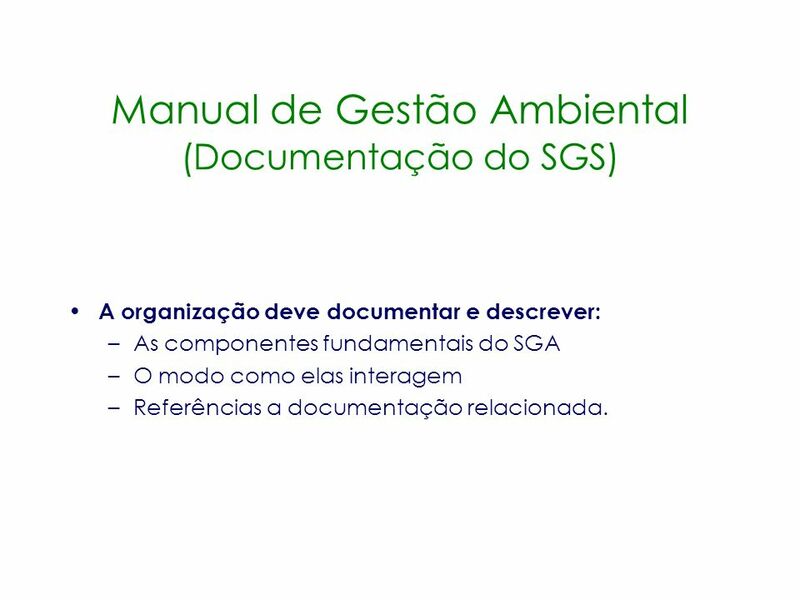 A documentação do SGA pode ser estruturada de acordo com uma hieararquia de documentos:. Nível 1: Documentos de controlo; política, objectivos e metas, legislação e outros requisitos, etc. 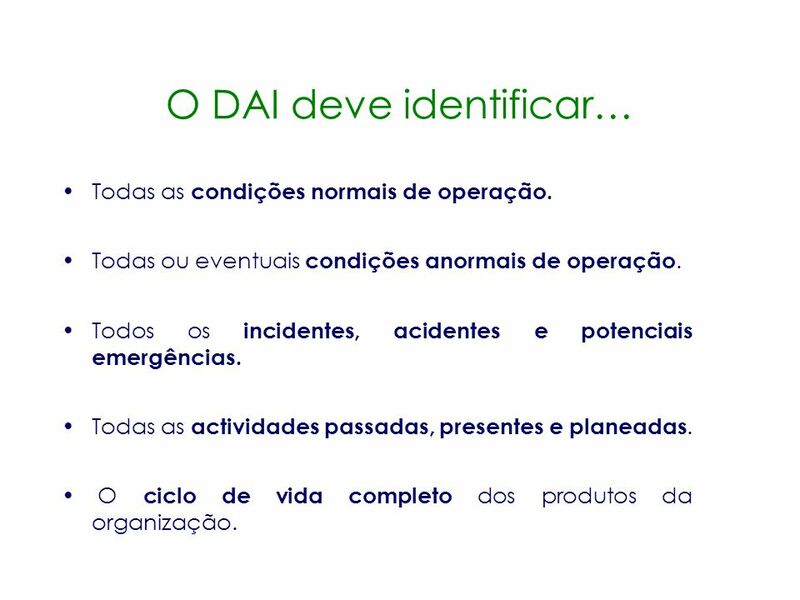 Nível 2: Procedimentos ambientals (procedimentos do sistema e operacionais. Nível 3: Instruções de trabalho. Nível 4: Registos ambientais, checklists, formulários etc. As a rule of thumb, controlled status should be given to documents that are essential to the implementation and maintenance of your EMS and may periodically need to be recalled, updated or replaced. Conversely, uncontrolled status should be given to documents that are not intended to be updated once they have been distributed. In short, controlled documents should always be up-to-date and those that have been updated should be labeled accordingly. Documents can also be divided according to hierarchy. 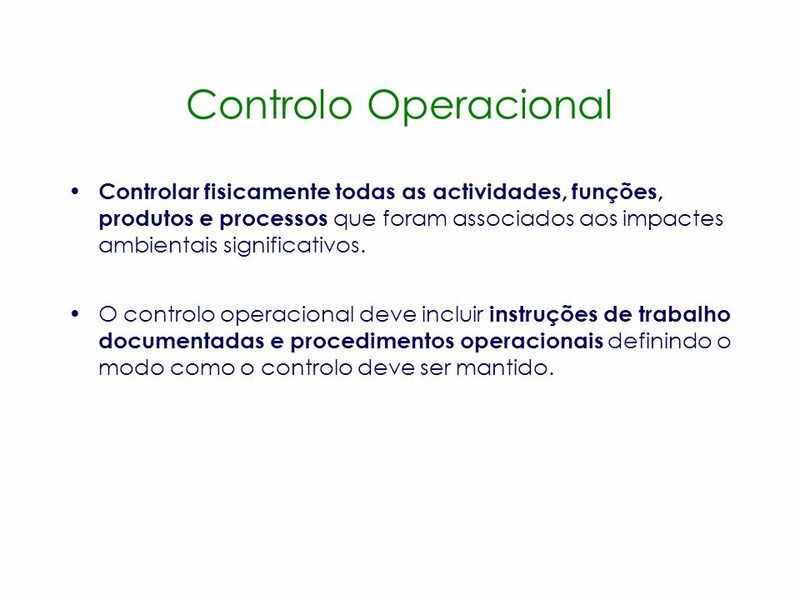 39 Controlo Operacional Controlar fisicamente todas as actividades, funções, produtos e processos que foram associados aos impactes ambientais significativos. O controlo operacional deve incluir instruções de trabalho documentadas e procedimentos operacionais definindo o modo como o controlo deve ser mantido. Improved environmental performance should be seen as contingent upon improved control of activities, products and processes (operations) that cause an identified environmental impact and in doing so, minimise the significant environmental impacts identified. The objective of this step is to explain what operational control is. This step will provide you with the skills necessary to ensure that your level of operational control is sufficient to maintain a functional EMS. Operational control is the set of procedures that ensure your operations (aspects) are controlled. Operational control consequently improves environmental performance by controlling aspects and minimising correlating environmental impacts caused by those operations. Operational control is established through the development and observation of procedures detailing how an operation is to be completed. Operational control is an essential management tool that will ensure your environmental policy and objectives and targets can be met. Operational control should cover all operations that are associated with any of the environmental impacts deemed significant in your initial environmental review process. 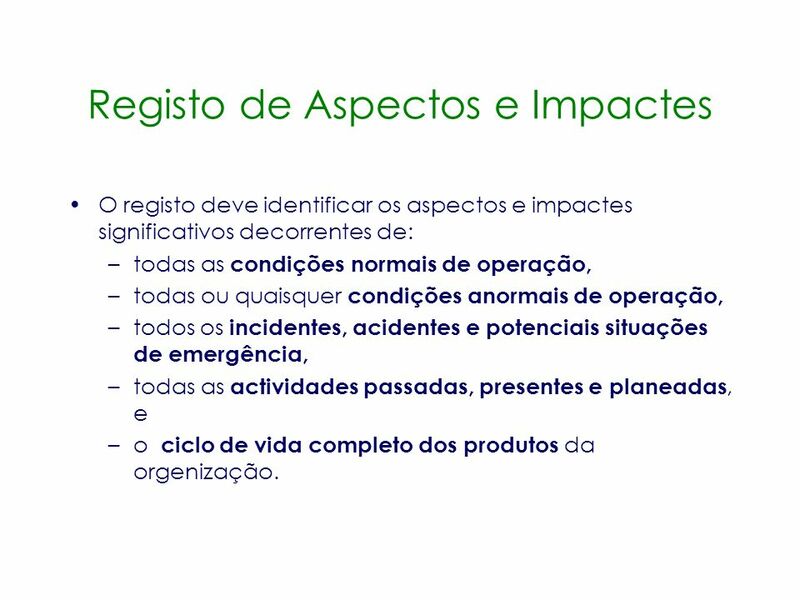 Procedimentos para: Identificar o potencial para acidentes e situações de emergência Responder de forma apropriada Minimizar o impacte ambiental de situações de acidente ou emergência. The final component that must be added to complete the implementation process is a procedural and systematic methodology for preventing accidents and emergencies and controlling them when and if they occur. The objective of this step is to explain what emergency preparedness is. 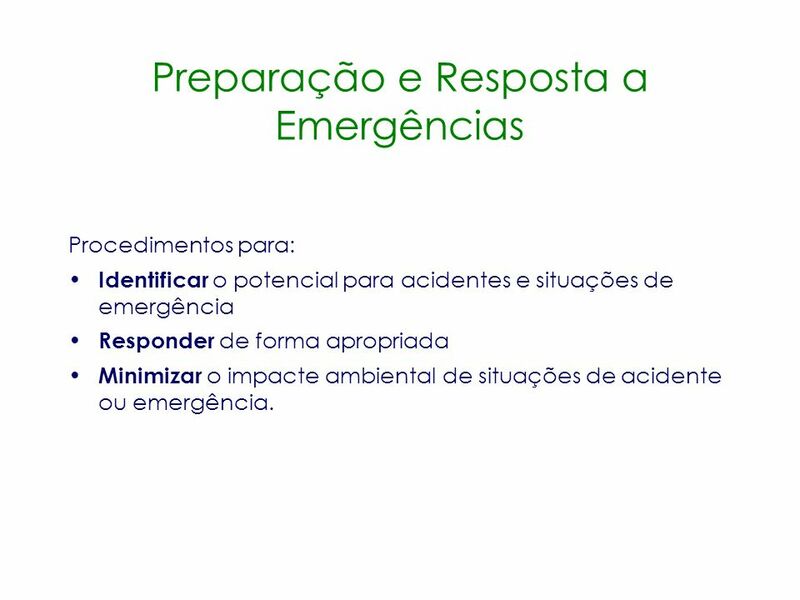 This step will provide you with the skills necessary to identify what level of emergency preparedness is required to maintain a functional EMS and develop methodologies for preventing accidents and emergencies and controlling them when and if they occur. 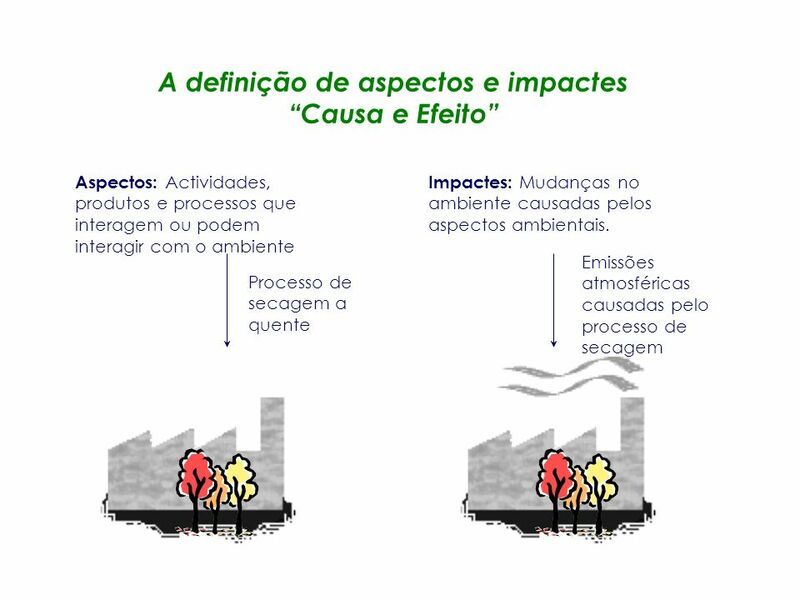 Estabelecer e manter procedimentos para monitorizar as actividades, funções e processos associados a um impacte ambiental significativo. 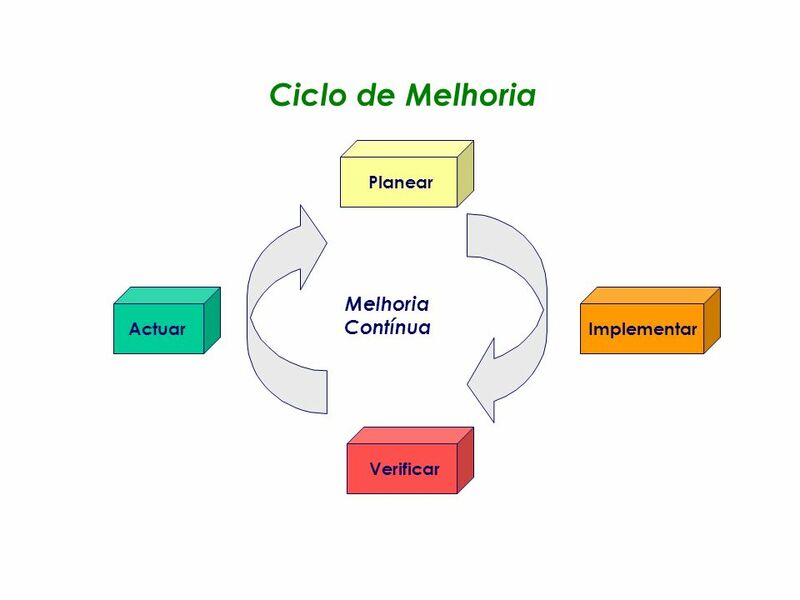 Estabelecer e manter procedimentos para medir o impacte que resulta daquelas actividades, funções e processos. 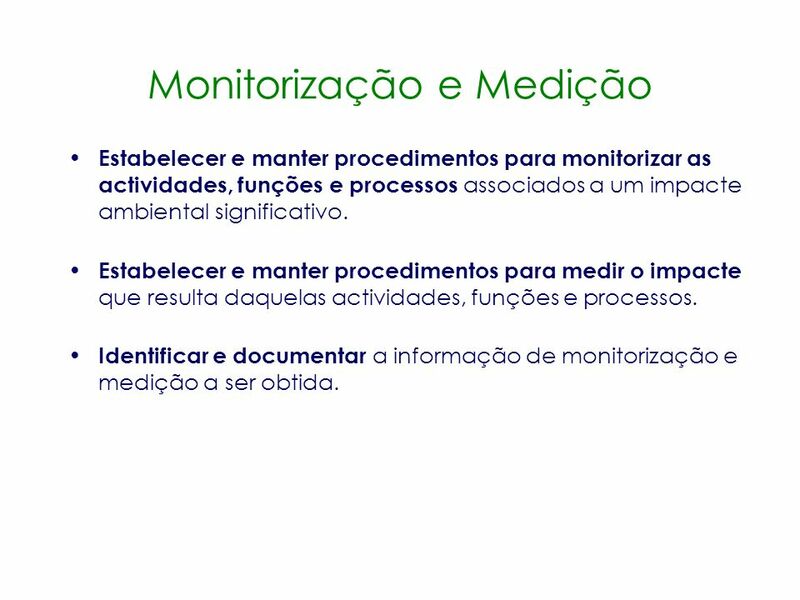 Identificar e documentar a informação de monitorização e medição a ser obtida. The objective of this step is to explain what monitoring and measuring is. This step will provide you with the skills necessary to identify what monitoring and measuring is required to maintain a functional EMS. An EMS must be able to provide a comparative reference or benchmark overtime by which it assesses progress toward its stated goal of environmental improvement. Monitoring and measuring is the means by which an organisation identifies its progress toward the minimisation of the environmental impact of its activities, products and processes. Investigar as inconformidades de modo a: determinar a causa da não conformidade. determinar qual o plano de acção necessário. determinar que medidas preventivas devem ser tomadas. 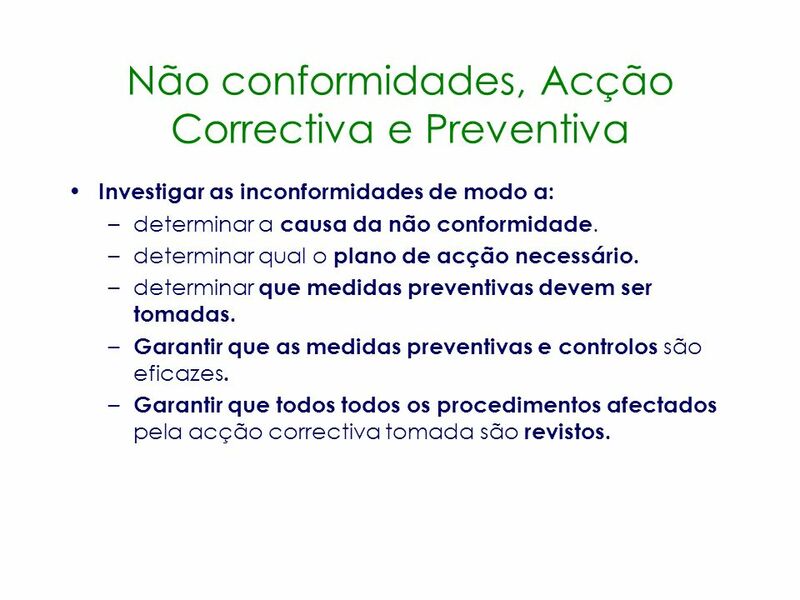 Garantir que as medidas preventivas e controlos são eficazes. Garantir que todos todos os procedimentos afectados pela acção correctiva tomada são revistos. You must have a written procedure detailing responsibility for investigating non-conformance of your EMS. This procedure must include a description of the methodology and authority for rectifying identified non-compliance. The objective of this section is to explain what non-conformance, correction and prevention are. This section will provide you with the skills necessary to identify non-conformances and apply the corrective and preventative action required to maintain a functional EMS. Non-conformance is the situation where essential components of your EMS are absent or dysfunctional or where there is insufficient control of your activities, products or processes to the extent that these absences compromise your policy, objectives and targets, management programmes and the functionality of your EMS. Correction is the act of developing or improving where non-conformance has been identified. Just as objectives and targets had environmental management programme (action plans) to ensure that you meet the objectives and targets set, corrective action should similarly have documented action plans that must be completed to ensure corrective action is taken and that it is effective. Prevention is the act of ensuring that non-conformances will not reoccur. Just as you would for any form of prevention, the prevention of non-conformance requires an understanding of what caused the non-conformance and ensuring that cause of the non-conformance is avoided in the future. 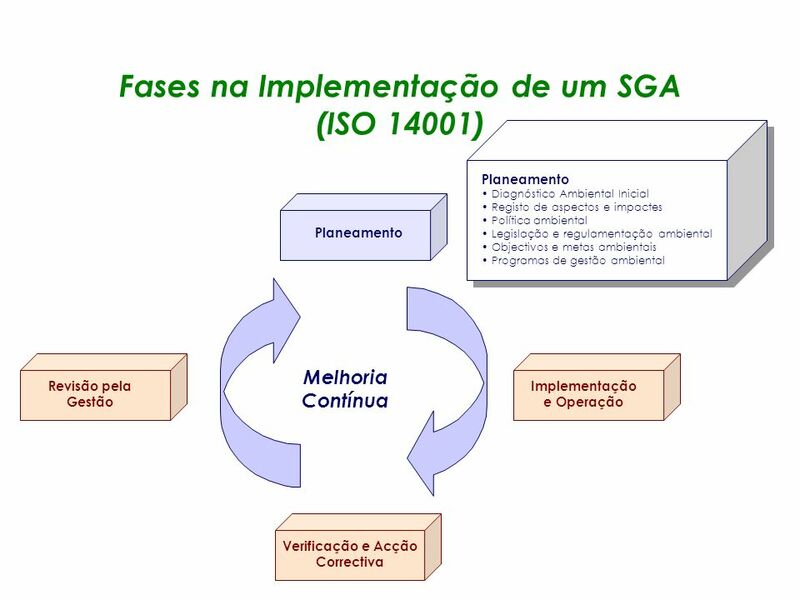 44 Registos Ambientais A organização deve realizar e guardar todos os registos ambientais requeridos para o desenvolvimento, implementação e manutenção do SGA. 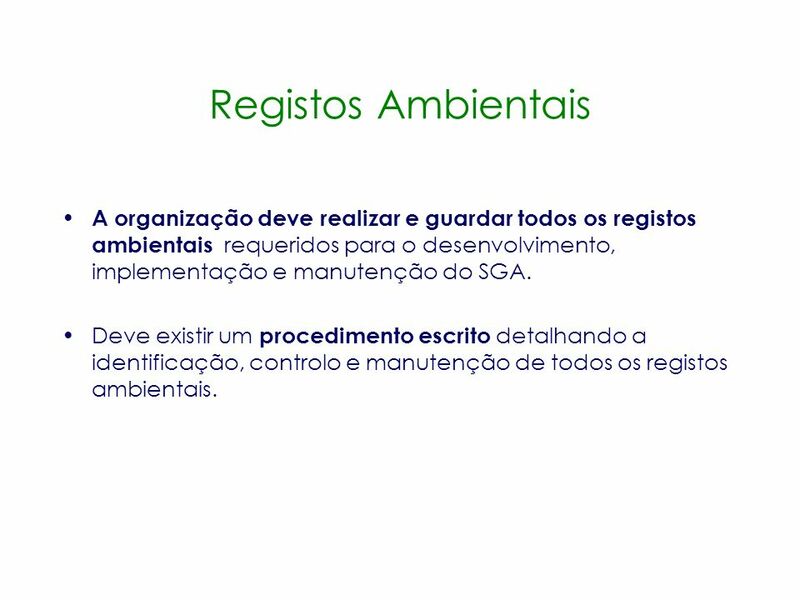 Deve existir um procedimento escrito detalhando a identificação, controlo e manutenção de todos os registos ambientais. You must have a written procedure detailing the identification, control, and maintenance of all EMS records. This procedure should cover records for monitoring and measuring, training provided, audit findings and management reviews. The objective of this step is to explain what environmental records are. This step will provide you with the skills necessary to identify what environmental records are required to maintain a functional EMS. 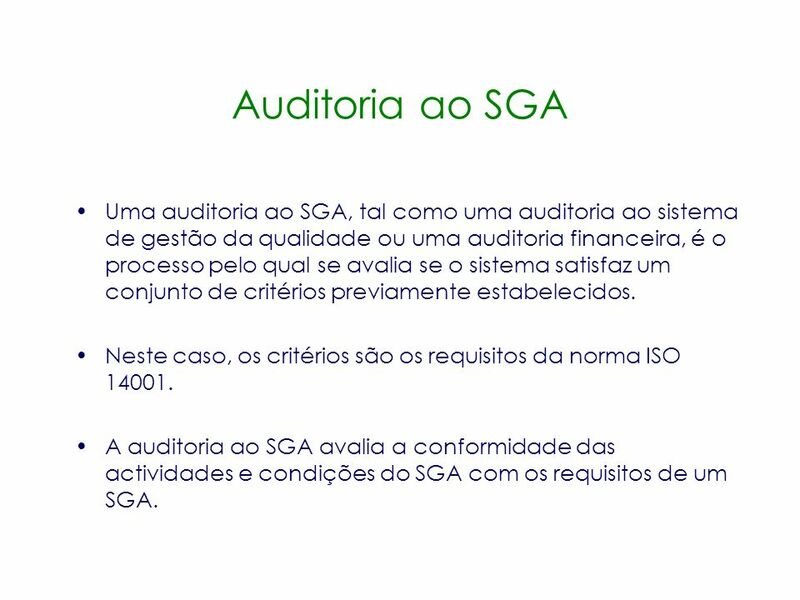 45 Auditoria ao SGA Uma auditoria ao SGA, tal como uma auditoria ao sistema de gestão da qualidade ou uma auditoria financeira, é o processo pelo qual se avalia se o sistema satisfaz um conjunto de critérios previamente estabelecidos. 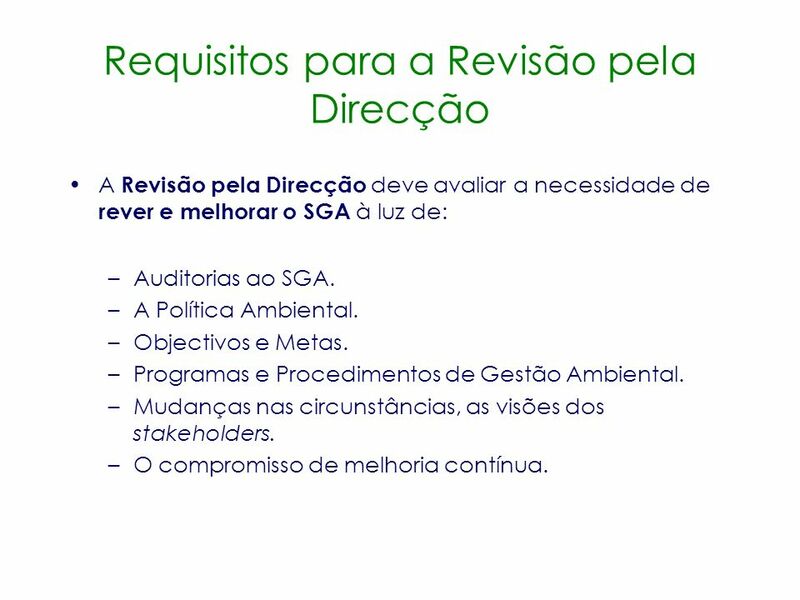 Neste caso, os critérios são os requisitos da norma ISO A auditoria ao SGA avalia a conformidade das actividades e condições do SGA com os requisitos de um SGA. 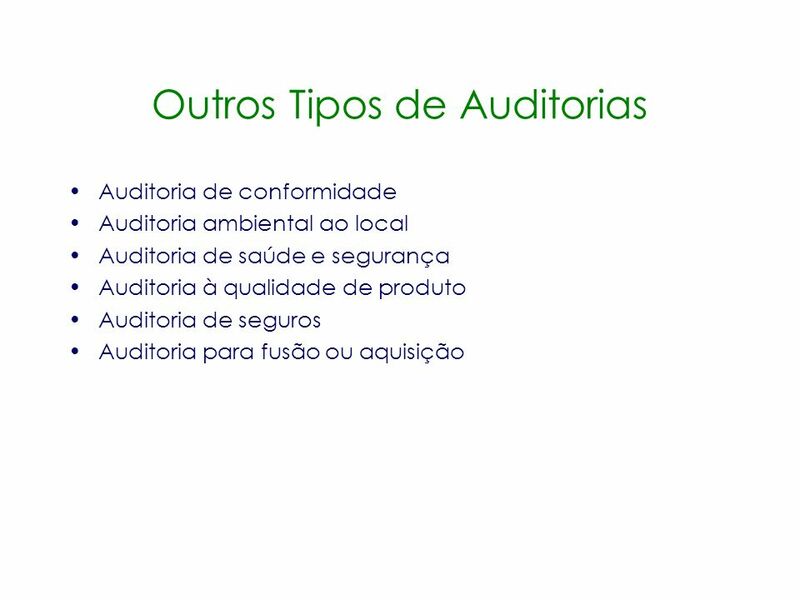 The objective of this step is to explain what EMS audits are. This step will provide you with the skills necessary to perform an EMS audit and identify what level of auditing is required to maintain a functional EMS. The ISO International EMS standard defines an EMS Audit as: Systematic, documented verification process of objectively obtaining and evaluating evidence to determine whether an organisation’s environmental management system conforms to the environmental management system audit criteria set by the organisation, and for communication of the results of this process to management. Essentially an EMS Audit is a tool that is used to check whether an on organisation is doing what it says it is doing. The EMS audit works to determine whether or not the activities and conditions of the EMS (the audit subject matter) conform to the requirements of ISO or EMAS (the audit criteria). The EMS audit is also sometimes called a “compliance audit”. Auditoria de conformidade Auditoria ambiental ao local Auditoria de saúde e segurança Auditoria à qualidade de produto Auditoria de seguros Auditoria para fusão ou aquisição Site environmental Audit: Similar to the initial environmental review, this audit covers site history, legislation requirements, management practices and environmental media. Health and Safety Audit: This type of audit is intended to identify potential hazards or risks to health as a result of production processes. Product Quality Audit: A check on the effectiveness of final inspection of the product, but it includes an evaluation of equipment and factory installations used to manufacture the product as well. Merger and Acquisition Audit: During a merger or acquisition, there is a need for assurance that the company is not about to take on some hidden environmental problem which might expose it to future liability or prosecution. Insurance Risk Audit: Insurers usually insist on a minimum risk audit of a site in order to reduce the risk of accidents or other environmental impacts. 49 Revisão pela Direcção A Revisão pela Direcção é a avaliação formal das conclusões da auditoria e da medida em que a política ambiental, os objectivos e metas e os procedimentos da organização estão a funcionar como ferramentas para melhorar o desempenho ambiental. Efectuada pela gestão de topo e por aqueles que desenvolveram as componentes do SGA em avaliação. A Revisão pela Direcção deve ser documentada. A Revisão pela Direcção deve avaliar a necessidade de rever e melhorar as intenções da organização em relação ao ambiente. As a requirement for an EMS it is essential to have a working knowledge of Management Review. While the EMS audit is the procedure of checking to see if the EMS is functioning properly, the Management Review is the process of assessing whether the EMS maintains it adequacy, suitability and effectiveness in relation to your organisation’s overall intentions with respect to improved corporate environmental performance. The Management Review of the EMS must be carried out by top management and by those who developed the EMS components being reviewed. The Management Review must be documented. The Management Review must assess the need to revise and improve the organisation’s overall intentions with respect to the environment, including your Environmental Policy, Objectives and Targets, Environmental Management Programmes and other key components of the EMS. 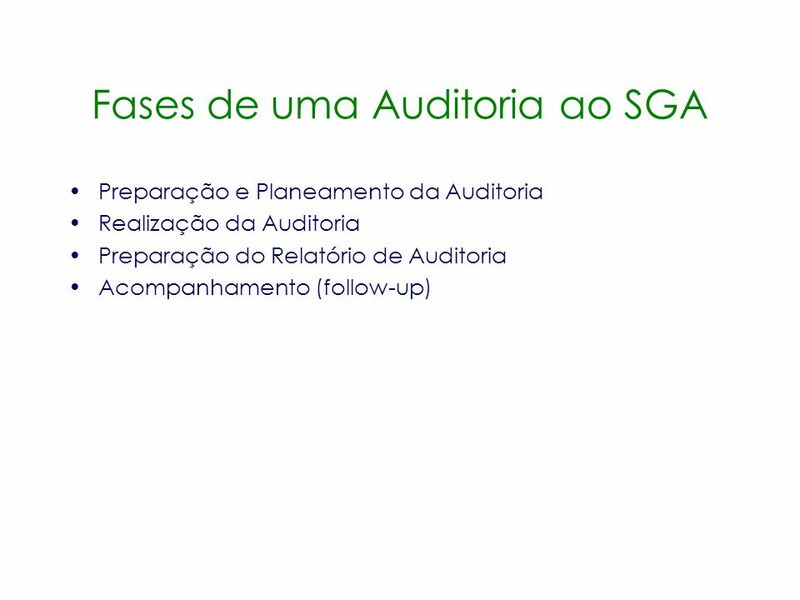 A Revisão pela Direcção deve avaliar a necessidade de rever e melhorar o SGA à luz de: Auditorias ao SGA. A Política Ambiental. Objectivos e Metas. 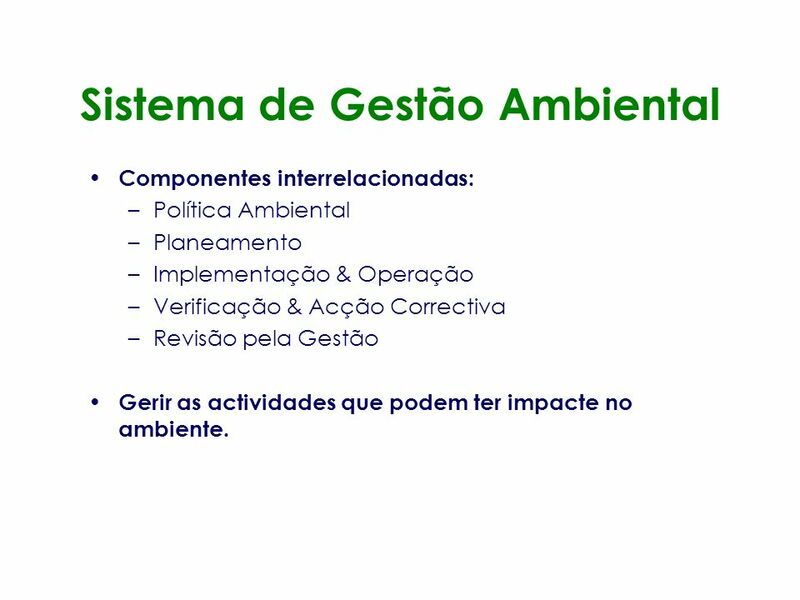 Programas e Procedimentos de Gestão Ambiental. Mudanças nas circunstâncias, as visões dos stakeholders. O compromisso de melhoria contínua. The Management Review deve assess the need to revise and improve the Environmental Policy, Objectives and Targets, Environmental Management Programmes and other key components of the EMS in light of: EMS Audits, The degree to which the Environmental Policy has been followed, The degree to which Objectives and Targets have been realised, The efficacy of Environmental Management Programmes and Procedures, Changing circumstances, The views of stakeholders, and [ISO 14001 The commitment to continual improvement. 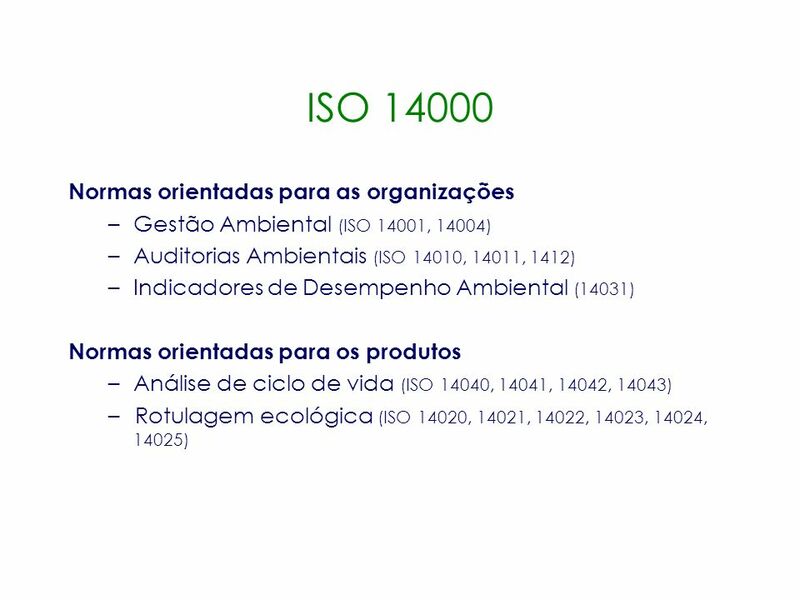 Gestão Ambiental (ISO 14001, 14004) Auditorias Ambientais (ISO 14010, 14011, 1412) Indicadores de Desempenho Ambiental (14031) Normas orientadas para os produtos Análise de ciclo de vida (ISO 14040, 14041, 14042, 14043) Rotulagem ecológica (ISO 14020, 14021, 14022, 14023, 14024, 14025) The different ISO standards have the following objectives: Standards for Environmental Management: to organise and co-ordinate environmental efforts within an organisation. Standards for Environmental Auditing: Check and follow-up environmental work. Standards for Environmental Performance Indicators: Evaluate and report on environmental issues. Standards for Life-Cycle Analysis: Environmental considerations during product design and development. Standards for Eco-labelling: Describe and communicate product properties. 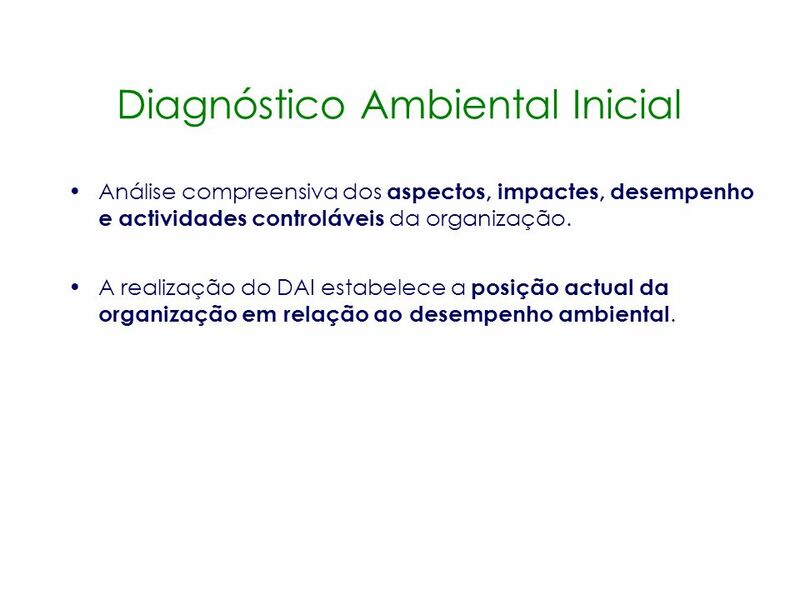 Carregar ppt "Gestão Ambiental As actividades das empresas têm impactes ambientais:"
AUDITORIA AMBIENTAL Prof. IDALVO ALEXANDRE. 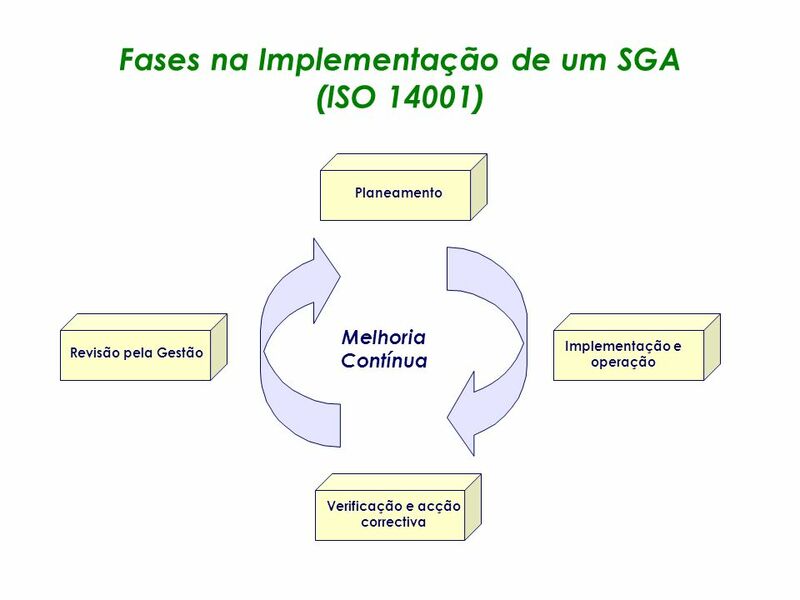 ISO 14000 Quem as fez? 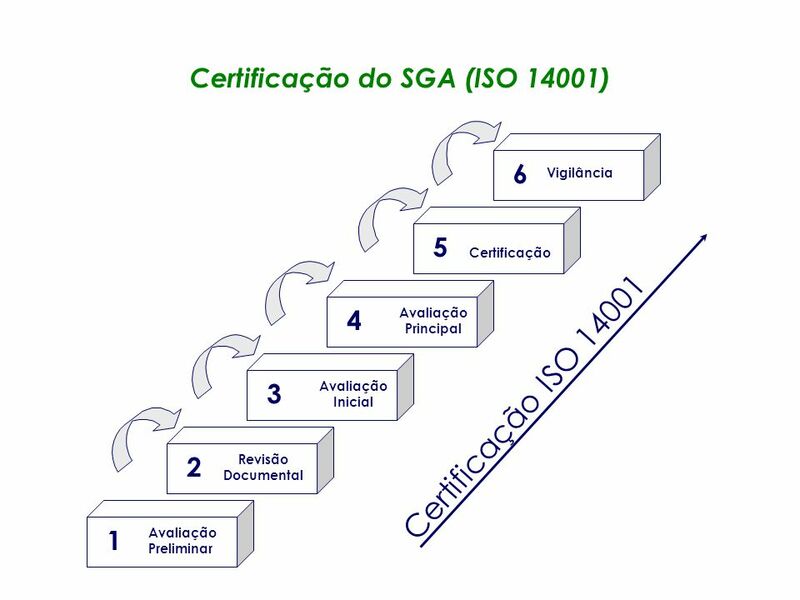 O Comité Técnico 207 da ISO é o encarregado de elaborar as 17 normas da série ISO 14000 e, para isto, formou 6 subcomités, os quais.